We are always looking for new and unique ideas to inspire volunteers and support throughout the country. 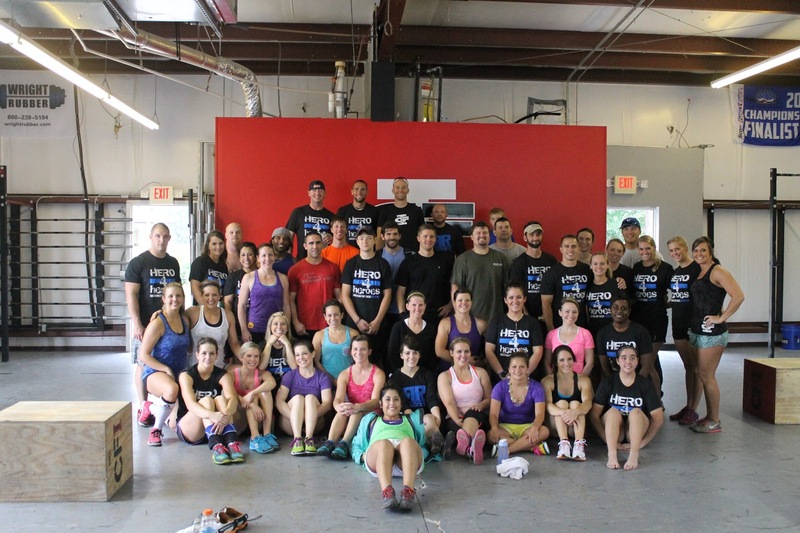 One of our newest Ambassadors—Deputy Davis Burnett, from the Elmore County (AL) Sheriff’s Office—found one such idea by contacting his local gym and coordinating a workout competition, which helped to raise just over $2,000 for the Memorial. Davis reached out to Jake and Mandy Baker who own Cross Fit Intrigue, a local gym in Wetumpka, Alabama. Jake happens to be a local fulltime firefighter with Montgomery Fire/Rescue. Together they came up with a workout competition that included completion of at least 45 push presses, 20” box jumps, and a couple pull-ups. Around 80 participated in four divisions, which included Rx Male, Rx Female, Scaled Male, and Scaled Female. The event was intense, action-packed, and fun for all. With each participant paying a $25 registration fee, Davis not only helped raise funds and awareness in his community for the Memorial Fund, but has inspired Jake and Mandy Baker to coordinate other future events. Thank you to Deputy Davis Burnett for his great idea and to Jake and Mandy Baker for their support! Today, members of the Iron Warriors Motorcycle Club gathered from all over the country at the National Law Enforcement Officers Memorial to pay their respects to their fallen coworkers and friends. The Iron Warriors Motorcycle Club (IWMC), is a non-profit organization consisting of active and retired law enforcement officers and firefighters who are dedicated to providing assistance and support to their communities, departments, families and members. Originally named the Wild Pigs Motorcycle Club (WPMC), the IWMC began in 1987 in the San Jose, California area, by police officers who owned Harley Davidson motorcycles, and who loved to ride with like-minded people. Included in today's event was an invocation, the presentation of colors by the District of Columbia Metropolitan Police Department Honor Guard, a musical tribute, brief remarks by Memorial Fund Chief Operating Officer Herbert Giobbi, and remarks from two of the IWMC chapter Presidents. The remarks were followed by a wreath laying at the memorial. Wednesday Night was a great night for baseball—and for honoring law enforcement—in New York! Over 23,000 fans poured into Citi Field on Wednesday, June 12 to see the New York Mets take on the St. Louis Cardinals during the 2nd annual Law Enforcement Appreciation Night with the Mets. 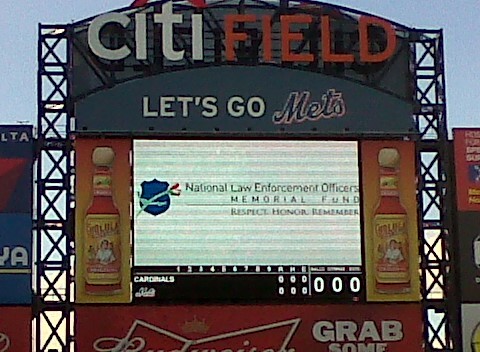 The Mets triumphed with an amazing 5-1 victory, while also dedicating the night to honoring the service and sacrifice of law enforcement. Commissioner Ray Kelly was in attendance, along with more than 150 law enforcement officers and supporters there to celebrate our peace officers and recognize their important work. During the pre-game activities, Memorial Fund Officers of the Month for June 2012—Detective Michael Pellegrino, Officer Jeffrey Caldwell, and Officer Frederick Dow of the Ewing (NJ) Police Department—stepped onto the field to be honored for their life saving efforts. Also honored was one of our biggest supporters and Officer of the Month Award sponsor, the Police Unity Tour. A special thank you to our Law Enforcement Ambassadors Chris Shoppmeyer, Erin Shoppmeyer, and Brent Clark for coordinating the event and assisting with outreach to local agencies. Thank you also to the Police Unity Tour, all the law enforcement agencies, and supporters who helped us get the word out about this event. We look forward to another great event with the Mets next year. Before snagging two tickets to paradise and selling more than 28 million records, making him one of the top selling American music artists of all time, Eddie Money was a police officer on Long Island. Last night, he played his greatest hits during a reception for loss prevention and law enforcement professionals at the National Retail Federation's (NRF) Loss Prevention Conference and EXPO in San Diego, CA. Stuart Levine, CEO of The Zellman Group, was the organizer of the reception and concert, as well a silent auction during the EXPO that helped to raise $1,900 for the Memorial Fund. The Zellman Group is a nationwide retail and hospitality support company specializing in loss prevention, audit, customer service shopping, employment screening and timely, cost effective civil recovery. 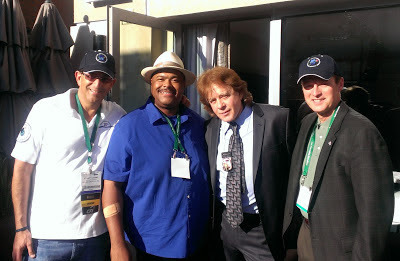 We greatly appreciate The Zellman Group and Eddie Money for their involvement with the Memorial Fund. Sunday was a great day for the races! The past Sunday, June 2nd, the Memorial Fund once again teamed up with Dover International Speedway® for our 5th Annual Law Enforcement Appreciation Day. More than 300 law enforcement officers, their families and supporters participated in our pre-race events which helped to raise more than $6,000 for the National Law Enforcement Museum Campaign. Pre-race activities included door prizes from the NLEOMF gift shop, bagpipes and drums, a Nascar® driver appearance, and the presentation of the NLEOMF Harley-Davidson raffle bike to it's winner Edwin H.! Kurt Busch, driver of the #78 Furniture Row Racing Chevrolet SS, stopped by to say a few words about the race and his experiences over the years on the track. Kurt was moved by the story of Sergeant Hector Ayala, a fallen officer from the Montgomery County (MD) Police Department. Hector's wife and son, Melissa Ayala and Hector Ayala Jr., came out to support the Memorial Fund and spoke poignantly to the gathered crowd about what the Memorial means to her and her children. Another of our big activities in the tent was awarding Edwin H. the Peace Officers’ Special Edition motorcycle he won from the 2013 Harley® raffle. Each year, Harley-Davison® donates a motorcycle for the Memorial to raffle off during police week. Their generosity has raised over $600,000 for the Museum Campaign. Edwin has been a law enforcement professional for more than 45 years in Nassau County. He spent 34 years as a Nassau County Police Officer, and for the past 11 years has been employed by the Nassau County District Attorney’s Office, assigned to the DEA Task Force. To finish off a successful day at the races, a check for more than $6,000 was presented to the Memorial Fund. On hand to except the check were Craig Floyd, Chairman and CEO of the Memorial Fund, the family of fallen officer Hector Ayala, and Mark Rossi, Vice President of Sales & Marketing for Dover International Speedway®. It was a great day for racing, the Memorial Fund and fans. Thank you to all those who participated and helped us make this event such a great success! Today, Philadelphia (PA) Police Department recruits visited the National Law Enforcement Officers Memorial in Judiciary Square. Each year, Philadelphia buses the recruits down to visit the Holocaust Museum, but this year it was decided that they would visit the Memorial as well. The recruits were encouraged to tour the Memorial to help them understand the ultimate sacrifice paid by the law enforcement officers whose names are engraved on the walls. The Philadelphia Police Department has 254 officers on the Memorial. McKinley Smith has been one of our Law Enforcement Ambassadors for the past three years. Among his many accomplishments, McKinley retired from the military as an MP for the Army, served at the Pentagon, and has been an active supporter of both law enforcement organizations, namely the Memorial Fund, as well as those that support our military veterans. McKinley has been involved with our Law Enforcement Appreciation Events—reaching out to the Chicago Bears and Military Police Battalions in the Chicago area—and was an integral part of promoting the Appreciation Event with the Chicago White Sox. And most recently, McKinley became involved with our new United by Light campaign, which encourages those who aren't able to travel to DC for National Police Week to conduct their own candlelight vigils at home. McKinley took the reigns in doing just that, by organizing a local event to honor the service and sacrifice of law enforcement officers in his community of Highwood, Illinois. Partnering with Buffo's and J.J. Service Center in Highwood, McKinley helped to host a special vigil event on May 13 and raise several hundred dollars for the Memorial Fund. Members of the Highwood, Highland Park, Lake Bluff and Lake Forest, Police Departments were recognized. Thank you to McKinley Smith for his leadership and commitment to our very important mission.